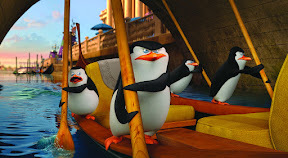 Tired of simply listening to the unofficial but oft-repeated Madagascar franchise theme song, the trilogy's scene-stealing penguins take the lyrics to "I Like to Move It" literally – launching themselves out of the circus setting of the third film (by cannon no less) and into their very own adventure in their eponymous debut feature, The Penguins of Madagascar. And once the Herzog described "frisky little snow clowns" tumble a long way down to rescue an egg, the trio of quick-witted penguins make like three men in an '80s movie and take it upon themselves to raise a baby. 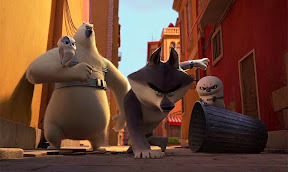 Rule-breakers from the start, after mixing things up internationally – both with and without their Madagascar costars on screens big and small (given the success of their eponymous Nickelodeon spinoff series as well) – the black-and-white foursome put their love of orange on the line. Breaking into Fort Knox to raid the Cheezy Dibbles snack machine of their dreams, the guys get much more than they bargained for than mere chips while attempting to satisfy not only their appetite but replish their arsenal as well, given their habit of turning the cheese puff-like chips into effective weapons via a form of salty self-defense you could call Crave Maga. 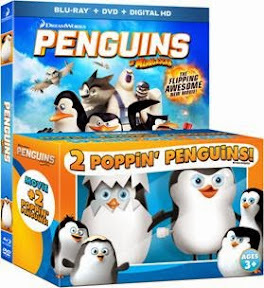 Suddenly hurled high into the air, the penguin army's food filled reverie is quickly interrupted when they're abducted by Dave, a former zoo-mate whose enthusiasm for cheese, mayhem and pop cultural witticisms rivals their own. Tired of being given the cold shoulder by zoo attendees who perpetually marched past the overlooked octopus in order to visit the photogenic penguins instead – causing him to be sent from one zoo to the next like a baseball player traded from team to team – the John Malkovich voiced villain decodes to reinvents himself as Dr. Octavius Brine in order to exact revenge. Whisking his enemies away by helicopter to Venice where we discover that he's been hard at work on an elaborate plot to declare war on the animal kingdom, Dave's ultimate showdown with penguin nation is put on hold when our heroes are intercepted by an "elite undercover interspecies task force" called the North Wind. 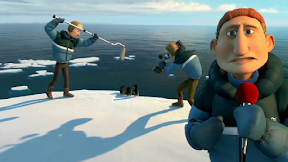 As organized and highly technical as the penguins are scrappy and bold, although the Benedict Cumberbatch led uber classified North Wind promises to be "dedicated to helping animals that can't help themselves," the ragtag penguins are eager to prove they have the guts and Dibbles to do the job themselves. Fast-paced and frequently laugh-out-loud funny, Penguins features some highly quotable celeb driven punchlines including "Nicolas Cage them," "Hugh Jackman the battle stations and "Charlize Theron their way" employed throughout. 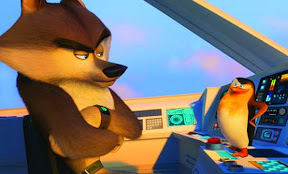 And although it gets increasingly outlandish as it continues, not realizing that it's at its best when it doesn't over-complicate and threaten to bog down its character rich plotline, it’s a great showcase for the Madagascar MVPs. Gorgeously transferred to Blu-ray in a combo pack that also includes DVD and Digital Copy, this Madagascar spinoff more than stands on its own as a family film of equal interest to adults and children, which is an enviable feat in its own right. 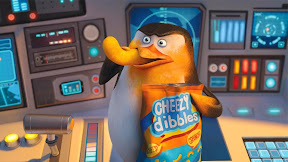 From its James Bond infused paradigm as well as its spectacularly inventive animated fight scenes that ridicule the editing and cinematographic styles of contemporary live action movies made by Michael Bay and company, much like those Cheezy Dibbles, The Penguins of Madagascar leaves you hungry for more.